In 2014, FkW was launched by a group of partner organizations in response to the government’s goals of establishing high quality pre-primary education. The FkW learning collaborative includes Aga Khan University (AKU), Children in Crossfire (CiC), Corporate Social Responsibility Group Africa (CSR), Dubai Cares, Maarifa, Mathematica Policy Research, Tanzania Home Economics Association (TAHEA), and UNICEF Tanzania. The Hewlett Foundation provided support from 2014 to 2015. Engaging and training head teachers to identify barriers to effective pre-primary education in their school. Head teachers are trained to develop and implement action plans that improve the quality of the school, classroom, and teaching, and/or address other important factors affecting pre-primary education. The head teacher training was designed to equip school leaders with the knowledge and skills needed to support preprimary education in their respective schools (Aga Khan University 2014b). Leaders from the same schools where teachers were trained were invited to participate in the five-day training. The course was designed to familiarize school leadership with early childhood education concepts and practice; build leadership and mentoring competencies to support preprimary teachers; and assist leaders in developing an action plan to support preprimary teachers and improve preprimary education. By the end of the training, participants developed an action plan based on their perceptions of their school’s preprimary needs. Improving teachers’ instructional and classroom practices through in-service training, mentoring, and feedback. FkW supports ongoing behavior change for teachers to promote adoption by teachers of evidence-based approaches that can bring about better learning outcomes and an improved classroom environment. The FkW course, developed by AKU, was designed to support pre-primary practitioners to enrich implementation of the existing National Curriculum. In response to identified priorities with stakeholders from the Ministry of Education and Vocational Training, Tanzania Institute of Education (Ministry of Education and Vocational Training (MOEVT), 2009) and other relevant stakeholders, particular emphases in this course include using play to support learning, engaging children interactively, and creating a conducive environment for the development of social, emotional and behavioural competencies. By implementing key practices, pre-primary practitioners will more effectively provide meaningful and engaging learning experiences, in part to ensure ‘school readiness’. Improving the classroom learning environment by creating learning areas for reading, manipulation (for mathematics), writing, and board games. The learning areas are an opportunity for teachers to use student-centered approaches and enable students to practice literacy, mathematics, writing, and social skills. Teachers are expected to make use of locally made learning materials in literacy and numeracy lessons, as well as sensitize and engage parents to support pre-primary teachers and education at home. To support these areas, CiC provided learning kits with furniture, stationary, reading and writing materials, games, and supplies to develop locally made learning materials. Transformed classrooms have: Learning areas for reading, writing, manipulation, and board games; Wall displays, early childhood friendly furniture or mats, and space for children to move; and learning kits, materials and teaching aids, mostly collected or locally produced, and used by all students. Engaging parents or caregivers in partnership programs to establish a working relationship between families and the school, and thereby enhance children’s learning. 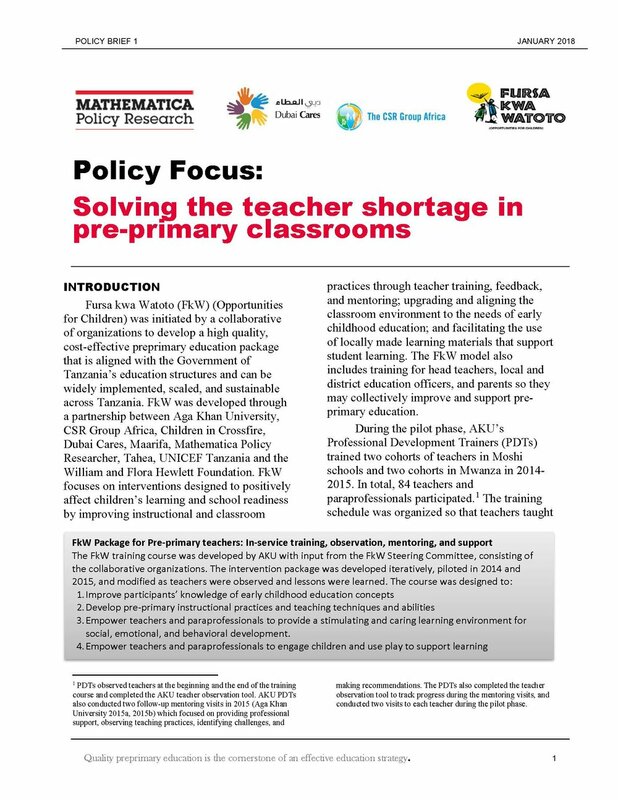 Families are asked to collaborate with pre-primary teachers, school leaders, and representatives from the school management committee to improve the pre-primary learning environment, both in the classroom and at home. Note that Component 1, Model 2 involves setting up community-based satellite schools to provide access to quality and cost-effective pre-primary and early primary education for children in hard-to-reach areas. Satellites should be located in communities where children are unable to reach the primary school. Satellite centres will be held to national standards and have active involvement and leadership from the GoT in collaboration with Civic Society Organizations (CSOs) and community governance and members (GoT 2016). Component 2 of FkW involves interventions to motivate effective local-level planning and management for quality pre-primary education. This includes improved capacity in both the local government and community in order to resource, manage, and monitor pre-primary education. This activity is also led jointly by CiC and UNICEF with local implementing partners at the district level. Component 3 focuses on national policy, program development, and the planning and budgetary processes to support quality pre-primary education. It also includes regional and global dialogue and evidence on quality early childhood and pre-primary education in Tanzania. Outcome 3 has been implemented by UNICEF Tanzania at the national level. This activity is led by UNICEF, which also works closely with CiC to ensure coordination of advocacy messages at the national level under Component 3 with those at the local level under Component 2. ¹ The content and components of Outcome 2 were developed toward the end of 2015.